The Witcher 3 won a ton of awards last year with endless GOTYs and best game gongs going its way. It's biggest haul though was from the Golden Joysticks where it scooped five in all: ultimate game of the year, best storytelling, best visual design and best gaming moment. 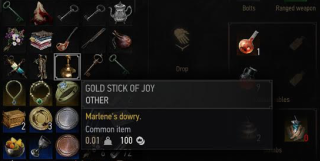 CD Projekt Red was obviously pretty pleased with that and has chosen to celebrate the fact by adding an actual Golden Joystick into the game via the recent Blood and Wine DLC. It a reward for a quest called 'The Hunger Games' where a woman asks you to collect her wedding dowry from a cellar. Once you get it you find the award, called The Gold Stick of Joy, and use it as a decoration in Geralt's vineyard house. It certainly does brighten the place up a bit and God knows the team (and Geralt) definitely earned it.